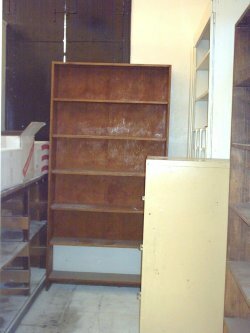 In the Historic Courthouse in Buchanan, home to the library, the north vault is being remodeled for exclusive use of the library as an adult fiction room. Underwriting the cost of this job is a $20,000 grant from the State of Georgia. Mary Jarrell is directing this work. Most of the reconstruction needed is being done by local craftsman Roy Black. Completion of the project is expected before the end of the year. At the time this is being written, the construction work is mostly complete. HVAC service was established earlier in the year. Recently new walls were erected to partition the vault. The photos below show the vault as it appears today. 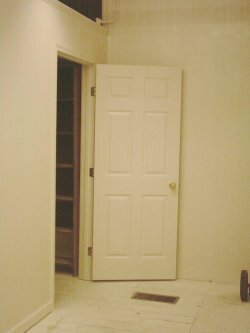 Soon, carpeting will be added and shelving installed. 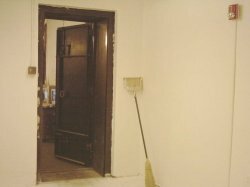 The freshly painted walls contrast with the black steel vault door, through which one exits into the main reading room. 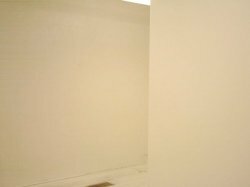 Looking around the almost camoflagued storeroom corner from its entrance foyer. Current temporary contents of the new storeroom. Note black metal shutters. In the middle half of 2006, the library provided TV programs about books all day long. These were displayed on a 25" TV set in the main reading room. Patrons could elect to listen to these programs without disturbing others by borrowing headsets which plugged into an audio patch panel in the center of the four central adjacent tables in the room. Each of up to four patrons at once could enjoy an individual volume control. Programs were repeated daily with the same schedule for a week, with a new set of programs loaded every weekend. Programming material included both audio and video programs published as podcasts via the Internet from radio stations, bookstores and universities all over the nation. About $200 from the Friends paid for the needed audio and power gear and new furnishings. A benefactor lent a PC to run the system. Sad to report, this home-grown version of "Book TV", inspired by the weekend C-SPAN program of that name, met with wild indifference from the community. No more than one person ever used the four-person system at a time, and it was a rare event indeed to see even that one person. This being the case, programming was discontinued after the summer. A legacy of this enterprise is audio and power wiring which serves the central table position described. Unlike BookTV, the library's WiFi hotspot has proved a success with up to three simultaneous laptop PC users observed at the central table complex at once. Such patrons are now offered the amenity of plugging in their PC to preserve battery power, or continuing to work should it almost be depleted of stored power. In addition, telephony wire also serves the central table. 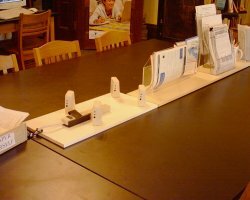 This allows use of a conference speakerphone for meetings held in the main reading room after library hours. The Historical Society, which runs the Historic Courthouse, made use of the conference speakerphone during its last meeting, when its President was off-site but conducted the meeting all the same. Wiring is routed through a metal conduit under a throw rug at the west end of the room. 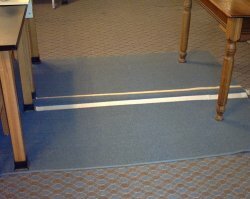 Tape strips enhance safety by drawing attention to the gently countoured bump in the rug.